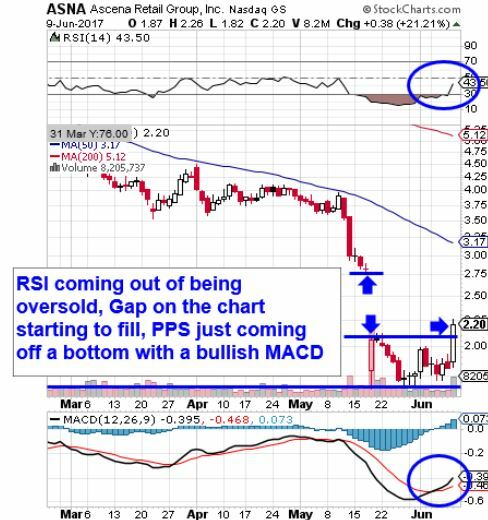 Yesterday morning, we decided to highlight the attractive chart setup on DSW with the stock trading at its lowest PPS since May. Despite another tumultuous day for the markets at large, DSW made an early dip-and-rip that savvy traders could have taken advantage of. We designated the DSW 12/21 $22.50 & $25 Calls and were met with instant success. Both of those contracts produced significant gain opportunities in the first half of the session. The $22.50′s ran from a low of 2.05 and reached as high as 3.50 for a gain of 71% The $25′s fared even better, posting a multi-bag pop from .65-1.50, a 131% move. It spent the rest of the week beginning to rebound off of the pullback to the $12-range which followed that huge spike, and is presently trading back in the $16-range. We’re going to want to continue to keep an eye on this blockchain related play, as almost anything even remotely tied to the white-hot sector has a chance to see further surges at any time if the price of BTC sees more new highs. As of this morning, one Bitcoin is worth just over $11,000USD. It has been a very solid run for VZ since we signaled a range of contracts to observe on the morning of November 17th, the VZ 01/19 $45-48 Calls. We saw the stock trading at 44.62, and that was followed by sessions after session of new highs leading all the way through Friday, when it reached 51.55. We noticed an interesting set of events playing out with EGBN- the stock absolutely fell off a cliff last week, tumbling from nearly $70 on Wednesday, to the low $46-range on Friday. Apparently it was the result of a hyped up short seller report by Aurelius Value, an anonymous online firm that supports short-sellers. The company published a statement of its own calling the report “a deceptive and materially misleading piece“. We tend to give credence to the actual company’s public statement rather than a group of shorts hiding behind a curtain somewhere. That’s why we’re going to place the EGBN 12/15 $50-60 Calls on watch in the days and weeks ahead, for what should be a forthcoming recovery in EGBN. We flagged DCTH in Friday’s premarket reportas a prime bottom-bounce candidate that could be in line for a serious rebound, and even despite the markets as a whole taking a gut punch, it ended up being a great single-session play, and the NASDAQ’s top gainer. From an early low of .0501 the stock surged as high as .0845, which works out to an intraday rise of 69% and it occurred on more than ten times the 30-day average volume, with DCTH logging its second-highest daily volume of all time. We’d say our timing was extremely fortuitous on this rebound play, and with the kind price action and liquidity that we witnessed Friday, we’ll definitely be interested to see how the action unfolds to kick off this new trading week. We wanted to make mention of TROV this morning after noticing a cherry of a PR buzzing over the newswires. The company announced an agreement to provide tests and services for pharma giant AstraZeneca. Whenever we see one of these smaller pharma company’s have joint news with a big player in the sector, we always want to pay attention to the stock. A perfect example of this is Pieris Pharmaceuticals, Inc. PIRS, which we signaled back on May 4th when that company also had news tying it to none other than AstraZeneca. What followed was a 55% run lasting nearly a month that took it from 3.26 the following day to a high of 5.06 last Monday, the 31st. On the chance that TROV experiences a similar bullish push on the heels of its own AstraZeneca announcement, we’re going to be sure to have this one on watch in coming sessions. We’re also taking notice of a nice technical setup on ASNA, which owns the Lane Bryant retail brand among others, and was another of the NASDAQ’s top gainers of the day on Friday. The activity came in the wake of a rather disappointing earnings release in terms of financials, but investors clearly responded well to the company outlook moving forward. As you can see on the included snapshot, the stock picked up speed in its recent ascent off of a bottom, and began to fill a gap on the chart to the upside. We also have a number of other indicators pointing to a possible continued uptrend, so we’ll afford this stock a slot on our watchlist.